Clay Aiken – Fun Facts! To me, Thanksgiving is the best time of a year!! You probably guessed that as I seem to post more graphics on the blog at this time of year. 2. About 46 million turkeys are cooked for Thanksgiving each year. It’s tradition, after all! And on Christmas, 22 million families host an encore with another turkey. 3. Only male turkeys actually gobble. You may have been taught in pre-school that a turkey goes “gobble, gobble” — but that’s not entirely true. 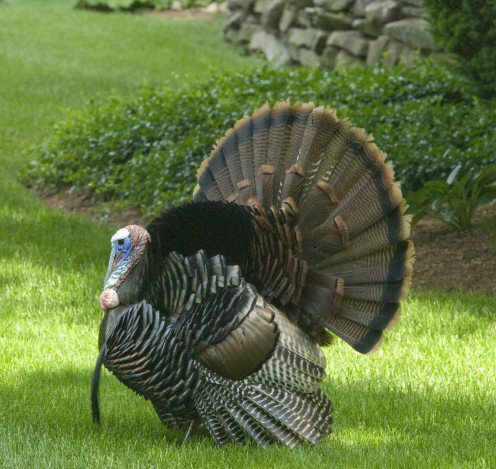 Only male turkeys, fittingly called gobblers, actually make the sound. Female turkeys cackle instead. 4. Most Americans like Thanksgiving leftovers more than the actual meal. 5. There are four places in the country named Turkey. The U.S. Census has identified another seven called Cranberry, and a grand total of 33 dubbed Plymouth. The website, TheaterMania, has put together a great video of Clay Aiken and Ruben Studdard and their interview on Monday. It is new to me and I always enjoy watching the guys joking together. The video also has a bit of beautiful singing. I hope you enjoy it! Have a great day and if you are traveling, be extra careful!! Thanks for the info on Thanksgiving. I loved the video. Everyone have a Happy Thanksgiving. Be safe. How can you not absolutely adore these two guys . I hope their show sells out every night . I'm Thankful for all the Clay promotion the past couple of weeks!!!! It's been such a long time. HAPPY THANKSGIVING to all my American friends!!!!! Enjoy!!! This concert looks like lots of fun with Clay & Ruben. If only they would do a summer show that is easier to get to. Christmas time in NYC is exciting, but very costly. Error: Error validating access token: Session has expired on Tuesday, 21-Aug-18 16:13:01 PDT. The current time is Thursday, 25-Apr-19 07:56:58 PDT.